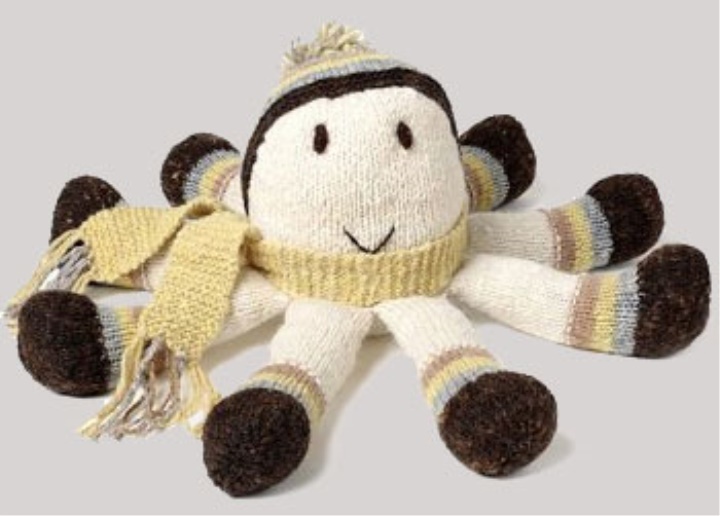 Octopus is good to knit from wool or wool mixture color you like. The toy can be knitted and knitted with a simple crochet and crochet pattern. We will consider crochet. For crochet fit hook number 2. The main technique of knitting: semi-column with double crochet. Start - 4 air loops. 1st row: 4 double crochets in the 1st loop of the chain, 3 air loops on the rise. Knit a half double crochet all subsequent rows, adding half a double crochet at the beginning of each 3rd row. So knit a minimum of 32 rows until the canvas expands to 15 semi-columns with a crochet (minimum). Next, knit 44 rows without additions. For eight legs, 16 pieces need to be connected. If desired, you can make them in different colors (for example, the top will be made with threads of the same color, bottom - of the other). Start - 6 air loops. Double crochets - 10 rows of a circle. 11 row - a uniform increase of 8 double crochets. Total - 128 columns. 12 row - joining to the abdomen of the lower parts of the tentacles by attaching their face to the front side of the abdomen and knitting with columns without nakida. Observe the distance between the tentacles. A scheme for a small body is presented, height can be adjusted to the discretion. Start: a chain of 6 air loops. Knit double crochets, at the beginning of each row, instead of the first column, knit 3 air loops for a lift, close the row into a circle with a semi-column without a single crochet. 5 and 6 rows - double crochet column to each previous column column. 7th row - 2 double crochets in every 2nd column of the 6th row, the rest - double crochet. 8 row - 2 double crochet in every 3rd column of the 7th row, the rest - double crochet. 9th row - 2 double crochets in every 4th column of the 8th row, the rest - double crochet. 10th row - 2 double crochets in every 5th column of the 9th row, the rest - double crochet. 11th row - 2 double crochets in every 6th column of the 10th row, the rest - double crochets. 12th row - double crochet into each single column of the 11th row, while uniformly adding 8 double crochets to make 128 columns (the last abdomen row). 13 row - double crochet into each column of 12 rows. 14 row - connect the top of the tentacles, as well as the bottom. The upper and lower parts of the sew, leaving a hole for stuffing.